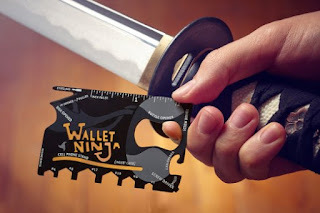 What do you think of this Wallet Ninja? Lifetime guarantee to never rust, bend, or dull. Measures 3 1/4" x 2 1/8" overall. Four times heat treated black stainless construction. Eighteen functions including bottle opener, four screwdrivers (Phillips, flat and eye glass screwdrivers), can opener, nail puller, peeler, (6) standard us hex wrenches (4, 8, 12, 10, 6 and 2), cell phone stand, box opener, letter opener and ruler (inches and CM). TSA approved.